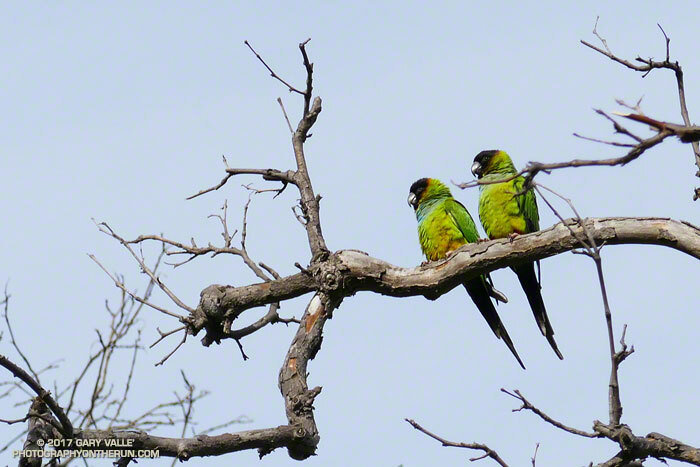 The raucous calls of these parrots can be heard throughout Big Sycamore Canyon. This pair was near the Danielson Multi Use Area. From yesterday’s run from Wendy Drive to the Chamberlain Trail. Update March 28, 2017. Here’s another pair of the Nanday Conures photographed on a recent run in Malibu Creek State Park along Crags Road east of Century Lake. Running along the recently repaired Blue Canyon Trail, I stopped to photograph a hillside of poppies. The shrieking, piercing cry sounded like it was just a few feet above me, and reflexively I ducked and looked upward. 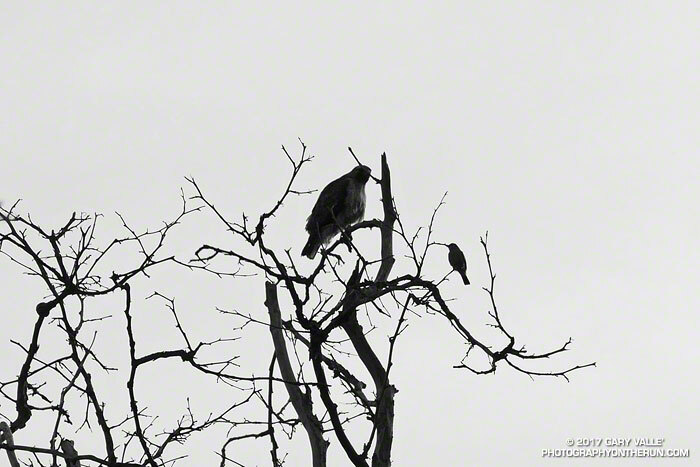 A large red-tailed hawk flew from the top of a sycamore tree to another tree. Just as I started to relax, there was another shriek, and another red-tail flew from the same tree. These were loud, aggressive calls and reminded me of an unusual encounter some years ago with a red-shouldered hawk and a bobcat. Noting the nest at the top of the tree I assumed the birds were upset that I stopped by their tree. I snapped a quick picture of one of the red-tails and headed on down the trail. As with the encounter with the red-shouldered hawk, there was an edge to calls of the red-tails that seemed urgent, and it wasn’t until I examined the photos later I saw their ire might have been directed at something else. The silhouette of the smaller bird looks like it might be a flycatcher — maybe a western kingbird. Red-tails are the star cruisers of the local bird world and it’s not unusual to see smaller birds harass them relentlessly like so many X-wing fighters. According to Cornell Lab of Ornithology’s All About Birds, “Western Kingbirds are aggressive and will scold and chase intruders (including Red-tailed Hawks and American Kestrels) with a snapping bill and flared crimson feathers they normally keep hidden under their gray crowns.” A search online found numerous reports of kingbirds harassing red-tail hawks. Mule deer are common in the Santa Monica Mountains. I see them most frequently in Topanga State Park, near Trippet Ranch, and in Malibu Creek State Park. 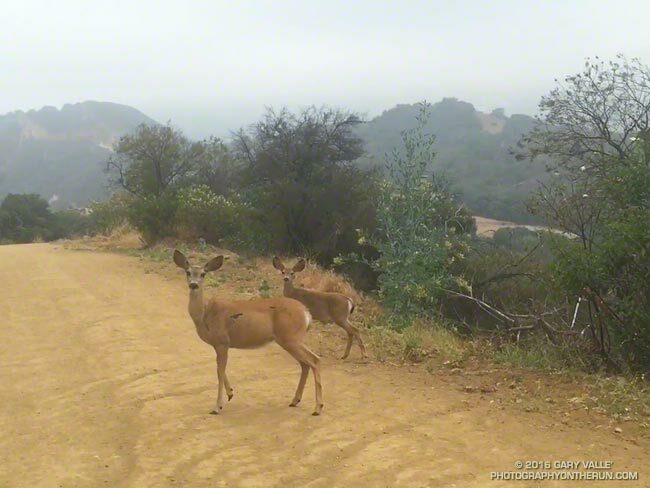 This video snapshot is of a recent encounter with three mule deer while running down East Topanga Fire Road to Trippet Ranch. My intent was to try and walk past without scaring them. One doe did not run, but the youngster and its companion were more skittish and didn’t quite know how to react. In some situations a bolting deer can be a real problem. Two friends running in Topanga State Park rounded a corner and were suddenly confronted with a spooked buck running toward them. There was a steep hill on one side and a cliff on the other. In the narrow confines the buck collided with one of the runners, hitting his shoulder and knocking him to the ground. All things considered he was very lucky. The bucks head was up, so the collision only resulted in a sore shoulder and some trail rash. What do a hilly marathon, a pair of cygnets, and a herd of bison have in common? Why, of course, a run in San Francisco. Brett wanted to check out some of the hills on the San Francisco Marathon course and show me more San Francisco sights. The result was a 14 mile loop that began in the Marina District and visited Crissy Field, the Golden Gate Bridge at Fort Point, Land’s End Park, Sutro Heights Park and Golden Gate Park. The run started with a visit to the Palace of Fine Arts to check on Blanche’s and Blue Boy’s new brood. Nature isn’t always nice, so it was good to see the remaining two cygnets are doing well. Most of the run between the Golden Gate Bridge and Golden Gate Park was on the California Coastal Trail. Near Sea Cliff we left the marathon course and continued on the Coastal Trail to Land’s End Park and Sutro Heights Park, eventually entering Golden Gate Park on its northwest corner at 47th Avenue. 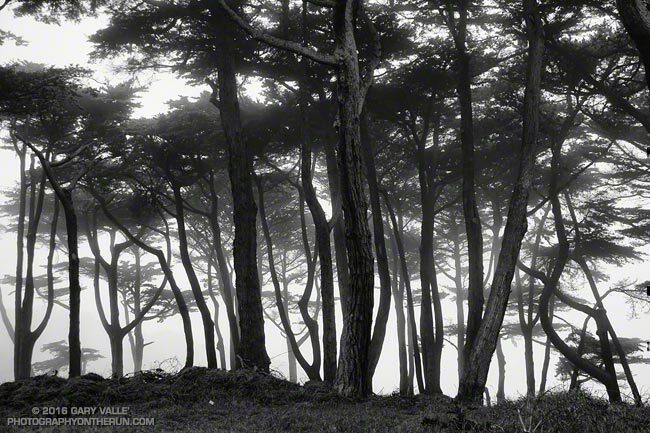 The title photo is a black and white image of Monterey pines along the Land’s End Trail. 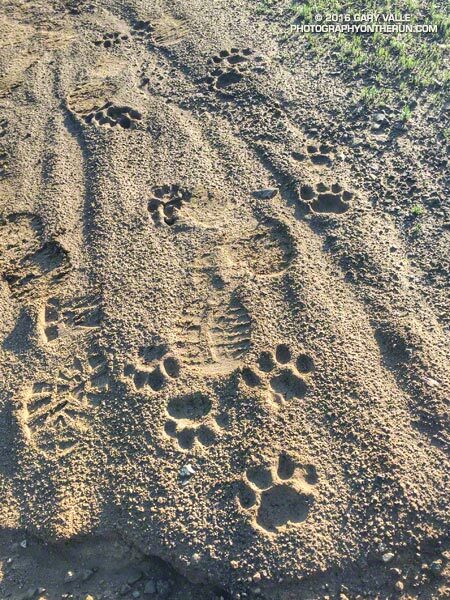 It’s Raining Mountain Lion Tracks! Like dust reveals a sunbeam, rain reveals the presence of our elusive Santa Monica Mountains mountain lions. I first noticed the tracks on Temescal Ridge Fire Road #30 more than a half-mile below the Hub (running from the end of Reseda) and then followed them past the Hub on Fire Road #30 to it’s junction with the Backbone Trail. After a short detour up Temescal Peak (no tracks), I returned to Fire Road #30 and followed the lion’s tracks back to the Hub, then down Eagle Springs Fire Road to Eagle Springs and past the fire road’s junction with the Musch Trail. It looked like the tracks were made sometime between yesterday evening, after the rain, and early this morning. The total distance I was able to follow the tracks was around three miles. 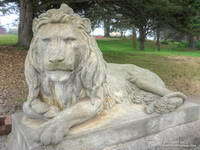 Although I had to turn around a little past the Musch Trail, I’d guess the lion was headed down to Trippet Ranch.